For those who enjoy the unexpected and esoteric sides of life, I have a souvenir for you to share with those you love to amuse. Algae. From green to red, slimy to coarse, and microscopic to enormous. Just mention the topic of algae, and many people think of the unsightly green film in swimming pools and fish tanks…or their eyes glaze over. Add to your unpredictability the story of potentially the most humble, unpretentious organisms on Earth. 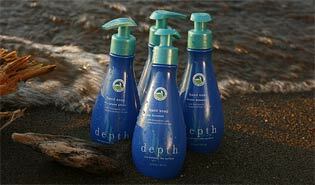 My name is Tim Schaeffer, I am the founder of Depth, an exclusive brand at Whole Foods Market. Depth offers body and hair care products based on the renowned skin benefits of marine algae, all formulated to meet the stringent Whole Foods Market Premium Body Care Standards. Prior to creating body care products, I was a marine biologist for ten years. My wife, Depth’s co-founder, is also a marine biologist, which is how we met. During my tenure as a marine biologist, my focus was on marine algae. I’d spend hours engulfed in all types of algae on land and underwater, studying their ecology and genetics. Believe me, I have first-hand experience in how algae can flabbergast friends. Marine algae (or marine botanicals) range in size from microscopic to towering, and can broadly be divided into three main groups: green algae, brown algae and red algae with each designation being derived from these species’ actual coloration. All algae have two primary functions – primary production and the creation of habitat. Both functions are critical to maintaining balance beneath the ocean’s surface. Think of primary production as the foundation of the food chain - tiny phytoplankton (the smallest of all algae) float in the water converting sunlight and carbon dioxide to food sources that are consumed by zooplankton. Zooplankton (the smallest animals in the sea) are then consumed by small fish. These small fish are in turn consumed by bigger fish, and the links in the food chain multiply from there. In addition to forming the foundation of the ocean’s food chain, algae also create the oxygen necessary to help support respiring marine species. It’s easy to forget that fish need to breathe underwater. Through photosynthesis, carbon taken from carbon dioxide is used to help the algae grow, and oxygen is released into the water. Fish, crabs, clams, tuna, and sharks…to name just a few…all respire oxygen present in the water in order to live. Creation of habitat is just what it sounds like…creating a home for other marine life. Just like a tree provides habitat for birds and insects, marine botanicals provide habitat for a wide range of species. Perhaps the most well-known is the habitat provided by kelp. Kelp is one of the few species in the world that completely change the habitat they live in, transforming a two-dimensional surface to a three-dimensional environment, much like a redwood forest does. For example, kelp provides a safe place for baby fish to hide. Have you ever had rockfish for your dinner entree? If so, kelp played a role by providing a place to hide from predators when the fish was much younger. When kelp is abundant, fishermen can typically expect more robust populations of rockfish in the future due to the sanctuary kelp provides. However, if storms or human activity deplete kelp forests, then these baby rockfish are more susceptible to predation, leading to smaller populations from which to fish. Other species rely on kelp for their habitat, as well…helping to keep the ocean community balanced. How does all of this relate to your daily life? You’d be surprised; there are a wide range of human uses of marine algae. Some species of red algae are used to harvest a compound known as carageenan. Carageenan is used in beer, ice cream, and toothpaste. Other species are used in fertilizers, and many are used in nutritional supplements. In body care, marine botanicals are known to be extraordinarily hydrating. Depth body products rely on wildcrafted marine botanicals to create products that are luxurious and moisturizing for skin and hair. Perhaps the most well-known and biggest industry of marine algae is that of Nori – the species you find wrapped around sushi. Yep, that’s algae on your sushi! The cultivation of Nori increased ten-fold from 1950 to 1980 after a British scientist, Kathleen Drew-Baker, began to understand the biology of the species. Nori farmers were so pleased with her discovery, and ultimate improvements in aquaculture, that they erected a bronze statue in Drew's likeness overlooking Shimbara Bay in Japan. To this day, farmers place a tribute of Nori from the current crop at the statue's feet every year. If you want to see pictures of some interesting species, do an internet search on any of these: “kelp,” “acetabularia,” “sea lettuce,” or “postelsia.” If you have a question about the ocean, algae, or other marine species and their role in our lives, let me know and I’ll try to answer them in future posts.